1987 Ford 7.5L 460" Econoline chassis, Starts but then dies. E350 chassis 7.5L. The engine starts and then dies after 30 seconds. The problem was finding the components to troubleshoot. First, the wires to the fuel pump in the tank showed power during start but none once running. 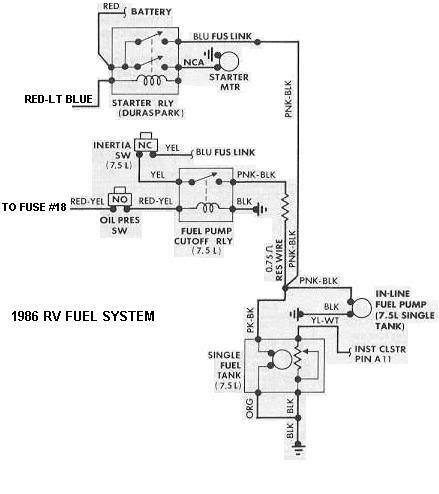 There is a set of safety mechanisms in the fuel pump circuit. If you have a crash, an inertia switch shuts the fuel pump off. 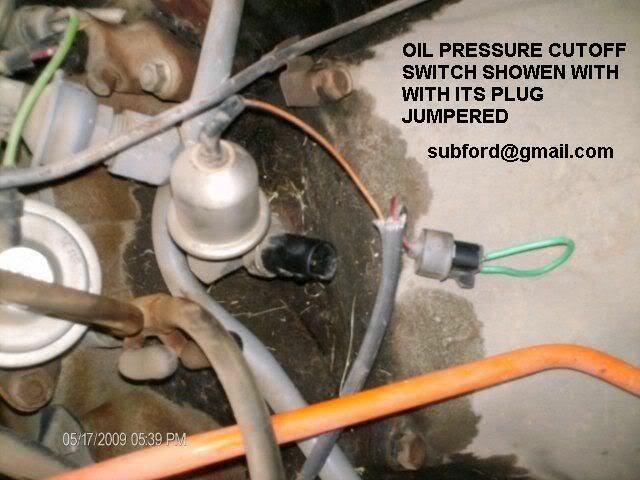 If the oil pressure switch doesn't work then the circuit is also shut. During start, a separate independent circuit will power the pump at any rate, letting the engine start up. You have done good work so far. The pump is kicking on when you turn the ignition to on like it should. However the EM sends the relay its on signal when it sees rotation of the distributor. That is what is not happening. Either the ECM think the oil pressure is LOW or it thinks the Distributor is not turning. Do NOT go around the relay OR the inertia switch. ALSO have you REALLY checked your oil pressure with a mechanical gauge?? Note that he does NOT have an ECM. He needs to jump the oil pressure switch, turn on the key and trace the power with a loading test light. The OP said oil pressure switch in the fuel circuit so it is not EFI. EFI does not use an oil pressure switch in the fuel circuit, it uses the lack of the PIP train instead.